Where do you do events? We serve the major Phoenix Metro area- Glendale, Peoria, Surprise, Goodyear, Avondale, Scottsdale, Mesa, Tempe, Chandler- you name it we go there FOR FREE. We ALSO travel to outlying areas such as Flagstaff Tucson Sedona (our favorite!) for a standard travel fee. 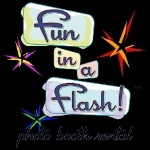 Why should we use Fun In A Flash? Because we are awesome! We are a devoted team with an established business. We hold full business insurance and use high quality materials. Our booth was manufactured by a reputable PhotoBooth company- not in our backyard and our printers and paper come from professional photo equipment suppliers- not your local office store. We are fun and enthusiastic and will bring entertainment to every event while still being professional. But mostly because we do it all! Even if there is something you want that you don't see here- just ask and we can probably do it! How many photos are you going to take? Our Green Screen Studio and Open Photo Studio can print up to 120 prints per hour whether that be unique photos or doubles/triple copies of certain photos. Speaking of doubles, what is the charge to print doubles? Oh that is free too :) It is included in every event. To book an event we will need a signed contract and a 50% deposit to secure your date. This can be paid with cash, check, card, or paypal. In certain events we have refunded the deposit- but our policy is usually no. We have reserved that date for you and potentially said no to other clients hoping to book us for that day. When you cancel it puts us at a loss. How far in advance to I have to book? It all depends on your event date. Wedding season (March-May and Sep-Nov) dates can book far in advance but some dates stay open until 2 weeks out. We have several studios and booths and can book many events on one day but there are plenty of times we have nothing available even months before the date. This is especially true around the Holidays when everyone wants a booth for their party. Do we provide any customization? Yes, each option comes with free customization. PhotoBooth strips are customized at the top and bottom of every strip. Green Screen Photos can have logos added, custom backgrounds, and text added to each photo. Our Open Photo Studio can also have logos and text added to the photos. FlipBooks are customized not only by creating a unique cover for each event, but we can also add a scrolling message to the inside of the books. What is the charge to receive a digital copy of all of our photos? It's FREE! After every event we will send you a disc of all of your photos or videos for free! What about an online gallery? Yes, we do that too- and its FREE also! Within 1 week your photos and videos can be viewed through our gallery tab and can be passworded as requested. Galleries will remain active for 60 days free of charge. Will set-up and tear-down come out of our rented time? Absolutely not! The time you pay for is YOUR time. We will be set-up well before your event starts and tear down quietly if your event is still going. The time you pay for is the time the booth or studio is available for use. Will there be anyone helping us during the event? Why is the scrapbook not included? Our scrapbooks are awesome. 3 ring leather style black scrapbooks, millions of sheets of colorful paper, hundreds of markers (ok- maybe I'm exaggerating) glue, and page protectors. This is gets expensive! To add it into our normal package raises the price for everyone- and some people just don't need a scrapbook (I can't figure out why...) so it's silly for us to have it as part of our package when many people will ask us to take it back out.